Jonathan Baud, the Swiss national arrested on charges of taking part in a meeting held at Thriprayar in Thrissur District on July 28, in remembrance of Sinoj, a Communist Party of India-Maoist (CPI-Maoist) leader, was acquitted by a Kodungallur court in the District on December 9, reports The Hindu. The court ordered the authorities to return his passport and others documents. While hearing the petition of Swiss national Jonathan Baud, seeking to quash the FIR registered against him on charges of attending a meeting to commemorate a suspected Maoist leader in July, the Kerala High Court said the police could not explain the crime committed by the Swiss national. Directing the state government to explain which condition of the visa regulations Baud had violated, Justice P Ubaid posted the petition for Tuesday. KOCHI: The Kerala High Court on Thursday granted bail to Swiss national Jonathan Baud, who was arrested for allegedly having links with Maoists, after he attended a meeting organised in memory of a Maoist activist. Justice K Abraham Mathew granted bail to the accused on condition that after release he should produce the undertaking of the Swiss Embassy to the effect that he would be made available as and when required by the investigating officer or the court concerned. The police had arrested Baud on July 28, on changes of violations under Section-14(b) of the Foreigners Act. Baud submitted that his character, antecedent and intellectual pursuits were clear from the various certificates issued by professors of the University of Geneva. He also submitted that he would produce an undertaking by the Swiss Embassy. The Director General of Prosecution has not opposed to releasing Baud after producing an undertaking before the court. The court directed Baud to deposit `1 lakh before the Magistrate. The court held that Baud’s passport would be retained by the Magistrate concerned. KOCHI: The Kerala High Court on Tuesday sought the view of the state government on the bail plea of Swiss national Jonathan Baud, who was arrested recently from Thriprayar for allegedly attending a meeting organised in memory of a Maoist activist. Baud, who was arrested on July 28, had been charged under section 14(b) of the Foreigners’ Act. The petition stated that the character, antecedents and the intellectual pursuits of Baud were clear from the various certificates issued by the professors in the University of Geneva. He is doing Masters in Economic History and keenly interested in history and economics. According to Baud, in the course of his travel in Kerala as part of his study he happened to see a gathering of people in Thriprayar. movements went to the venue of the meeting out of sheer curiosity. He was not aware of the background of the meeting. Baud was the only foreigner who attended the meeting and the representatives inquired about the identity of the petitioner. Then he informed that he was from Switzerland. Baud further submitted that registration of crime against him is illegal. There was no allegation that he was invited to the meeting. The police cannot initiate prosecution proceedings merely on the reason that the petitioner had watched a meeting. 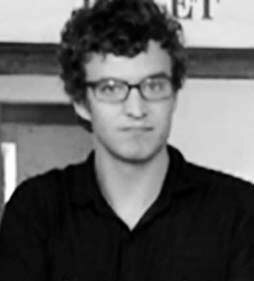 THRISSUR: A group of pro-Left intellectuals and human rights activists has launched an initiative for the unconditional release of Jonathan Baud, the Swiss youth arrested by Kerala police for alleged Maoist links. They will organise a convention here on August 6 to press the demand. Efforts are also on to appeal to the international and national academic and political community to press the Kerala government to drop charges against Baud. Activists said there was no legal or political ground for Baud’s detention as he was not engaged in any subversive underground act. “Police have not been able to find any clinching evidence so far to establish his alleged Maoist links,” Gandhian thinker and social activist K Aravindakshan said. Police, however, have not listed Maoist links in the remand report. Officers also admit that no additional evidence has been extracted to support the allegation during his interrogation in custody. The organisers of the meeting, attended by Baud, said he had just introduced himself after the meeting and shared his sympathies. Committee for the Release of Political Prisoners vice-president M N Ravunni, who presided over the meeting, said the government was according VIP treatment to Italian marines accused of killing Indian fishermen while using repressive laws to intimidate Baud. Poet and former Sahithya academy secretary K Satchidanandan said the arrest was violation of human rights. “There is no law in the country that proscribes a person who arrived in the country on tourist visa from attending a meeting. He was not a speaker there; he is well known in the French academic circles and has made important contribution to the intellectual culture. He respects Communist views, but is in no way engaged in any underground subversive act,” he said over phone from New Delhi. “I’m ready to wait, let’s see whether the police are able to collect some evidence,” he said. Swiss mission officials in India have been collecting details on Baud’s arrest but had not officially demanded his release so far. KOZHIKODE: The books police recovered from the hotel room of the Swiss national Jonathan Baud, who was arrested for alleged Maoist connection, include the works of former CPI general secretary A B Bardhan and a CPI leader from Chattisgarh. According to the police, there was no material in the room that linked Jonathan with the Maoists. The Swiss national was arrested for violating visa rules by attending the meeting held in memory of Maoist leader Sinoj, who was killed in an accidental blast on June 16. The books recovered from the hotel room are ‘Problem of Naxalite Extremism and Its Solutions’ by C R Bakshi, ‘Message of 21st Patna Party Congress’ by U N Mithra, ‘Subash Chandra Bose and Indian Communist Movement’ by Gautham Chatterjee apart from Bardhan’s ‘Economic Growth: Development and Empowerment’. A few paper cuttings on the death of Sinoj and the commemoration meeting at Thruprayar from English newspapers were also found at the hotel. Jonathan and his girlfriend stayed at the hotel, from where the former left for Thrissur. None of the books are related to Maoist movement. C R Bakshi is a CPI leader from Chattisgarh, who had organised protests demanding the release of Dr Binayak Sen, the physician arrested for alleged Maoist links. 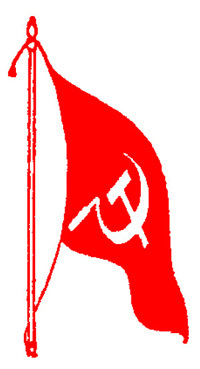 The book by U N Mithra is the document presented at the 21st party Congress of the CPI held at Patna in March 2012. Police believe that Jonathan is a communist sympathizer and his version that he landed at the Sinoj memorial meeting after seeing the news in an English daily could be true. He had also attended the Gaza solidarity meet organized by the CPM in Kozhikode on July 24. The organizers of the Sinoj memorial meet also had clarified that they had not invited Jonathan for the function. He sat through till the end of the meeting and expressed his desire to address the gathering after the meet was over, said the organizers of the meeting. Meanwhile, Kodungallur judicial first class magistrate court is likely to pronounce orders on Friday on the police petition for getting the Swiss youth into police custody. 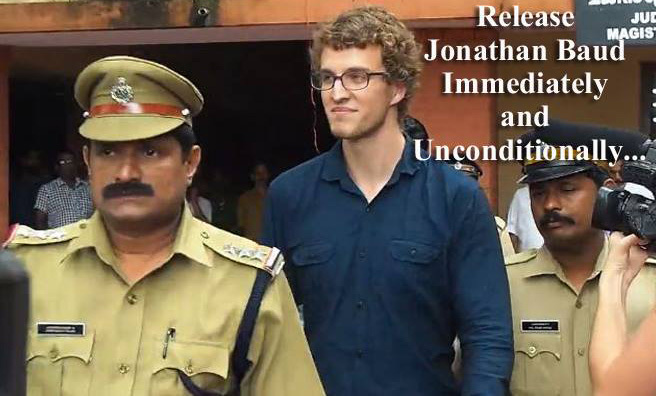 The magistrate on Thursday issued a warrant to the police to produce the Swiss youth Jonathan Baud who is now under detention at sub-jail in Irinjalakkuda in Thrissur district, before the court on Friday. The Arrest of the Swiss citizen Jonathan Board who came to Kerala on tourist visa, by Kerala police on flimsy grounds, is highly discriminative and with ulterior motive. After the arrest in order to justify the same Kerala police is fabricating canards, that Jonathan has link with Maoists and he has come to attend the memorial meeting organized by Maoists to show the respect towards the Maoist Guerilla fighter Sinoj who became martyr in an accidental explosion took place on june 16th of 2014. The police also alleged that Jonathan addressed the meeting hence violated Foreigners Act. The police has taken a case against him and incarcerated in the dungeon hole named Iringalakkuda Sub Jail,Thrissur District,Kerala. I was the Chairperson of the Sinoj Memorial Committee that organized the meeting and was a main Speaker. As the Chairperson I wish to state that Jonathan was neither an invitee to the meeting nor a speaker. And he did not addressed the meeting as the police was trying to depict with a sinster view. According to Jonathan, he came to the meeting only out of curiosity as he is a left lenient person. He got the information of the meeting from an English Daily News Paper. He listen to the speeches delivered in the meeting up to the end. In the meantime he also purchased some English handbooks. As the meeting was formerly over Jonathan himself approached the organizers and expressed his wish to introduce himself to the audience who was started disbursing. Out of the same curiosity as the Chairperson I agreed to his longing. He introduced himself and expressed that he also share our sorrow caused by Sinoj’s martyrdom. It was only a casual talk,any humanitarian from any corner of the World can express. The police and the state which is a culprit in granting V.I.P treatment to the Italian marines who had violated the international water laws as well as Indian laws and shot two fishermen to death is now taking a different approach to meet their narrow political ends. And I/We regret for the unfortunate faith met out with Jonathan, though created by state , and request to the progressive and democratic forces and personalities of International Community to intervene in Jonathan’s affair and put pressure on the India/Kerala governments and see that his release from the Jail unconditionally. THRISSUR: A 24-year-old Swiss national has been arrested after he allegedly attended a function organised in memory of a Maoist activist at nearby Valappad. Police said Jonathan Bold, who arrived in Kerala on a tourist visa, attended a meeting organised in memory of Sinoj, a Maoist activist from Kerala who was killed while making country bombs in Andhra-Karnataka border last month. The meeting was organised by a group having Maoists and Naxalite sympathies. Sinoj belonged to Valappad in Kerala. Jonathan has been charged under the Foreigners Act, Section 14(b), which pertains to violation of visa conditions. Police said some Maoist literature had been recovered from him. Jonathan arrived in Kerala on July 10 with a woman companion and had visited Kannur and other parts of the state before arriving here Monday. Since he speaks French, the help of an interpreter conversant in French would be sought for detailed interrogation, police said. He was sentenced to a 14-day judicial custody on Wednesday, pending investigation and is currently lodged at the Viyyoor Central Jail in Thrissur. According to Swiss news portal 20 Min, Jonathan, who recently finished his studies in Economics and Social Science, has worked as the secretary of the union for university students in Geneva. He is known for carrying out a major public demonstration over the increase in student fee in 2013. 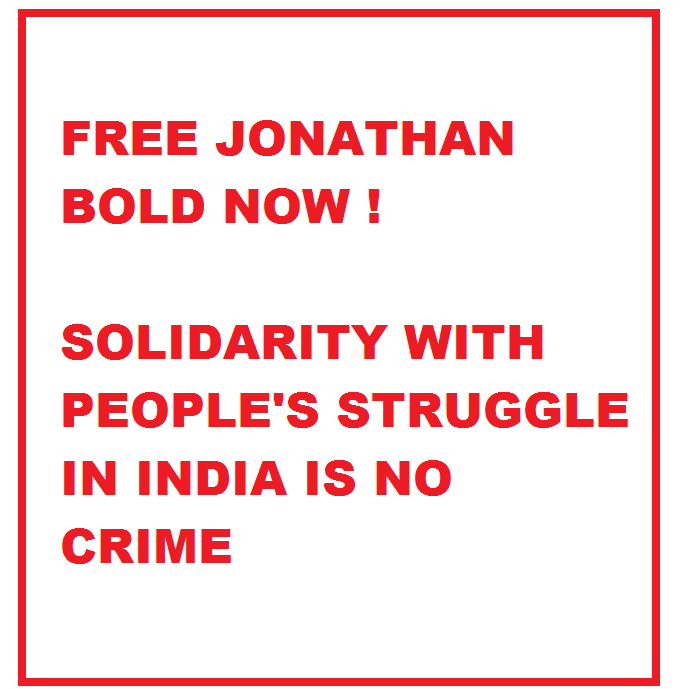 Reports in India claim that the police arrested Jonathan on Tuesday over suspicions of being a Maoist sympathizer. Jonathan holds a Swiss passport and arrived in Kerala on tourist visa.